We nailed down Great Lakes fly fishing phenom Greg Senyo, creator of Senyo’s Laser Dub, for a chat about fly tying, new materials and where he got the inspriation to develop new products through Hareline Dubbin. How did you come up with Senyo’s Laser Dub? What was the inspiration? Senyo’s Laser Dub is like reliving the past for local Lake Erie Steelheader’s. A product called Laser yarn was developed in the 1980’s by the late Ed Bordas called Steel Ed’s Laser Yarn. 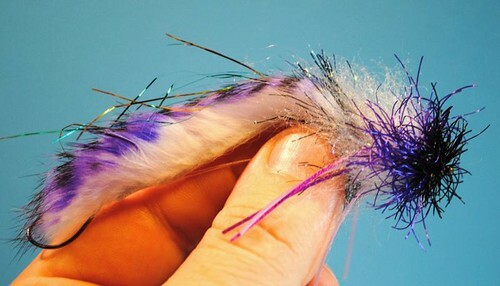 This product was made of natural furs and was a great tying material for local steelhead anglers. When Ed passed over 15 years ago; the material stock dwindled and eventually was no longer available. I loved using this material so much that I pitched the idea of creating a synthetic material with similar characteristics of Ed’s locally known laser yarn to Shawn Brillon of the Orvis Company, and Marcos Vergara at Hareline Dubbin Inc. Working along side with Marcos and Shawn and their expertise in fly tying and synthetic material properties, we where able to get the ball rolling. After a few months of testing different colors and materials we were able to create the product you know today as Senyo’s Laser Dub. Our Great Lakes steelhead feed on a smorgasbord of different fish species such as Emerald Shiner, Dace, Perch, and Goby to name a few. Tying big streamers and sculpins with traditional wool or deer hair can become quite time consuming on a guides schedule, so by using Laser Dub I can create custom large sculpins, baitfish, leeches with hot heads or in natural colors by simply stacking on the material, tying the material down with a few thread wraps, folding over and comb out the loose fiber, or simply applying the material in a dubbing loop. No trimming is necessary! Add the fact that veiling egg patterns in multiple colors, hot spotting thoraxes on nymphs, creating small fry, and minnow imitations are extremely quick uses for laser dub as well. Being able to incorporate one material into many uses has simplified my prep time and tying, and had made filling my guide boxes with streamers, eggs, and nymphs much more efficient and practical. I use it a lot for adding a hot-spot to the front of a fly. What are your favorite uses for it? What are some that people may not have thought of? I pretty much use laser dub in most if not all of my steelhead, salmon, and trout patterns in some way or another. My favorite applications for laser dubbing are in building Sculpin heads and small fry-minnow type imitations. Laser dubbing is just so easy to use, and it blends together and works well with just about every fly tying material out there. From the feedback I am getting, people have found easy and practical ways to incorporate laser dubbing into their own custom patterns. Only recently anglers have been incorporating laser dubbing into dry flies, by using the material to create highly visible Parachute posts, and sparse spinner wings with the white laser dub. I really enjoy using the material in creating mayfly and caddis emergers due to the laser dubs translucent properties, sparse flash, and it seems to trap and hold small air bubbles in the fiber. 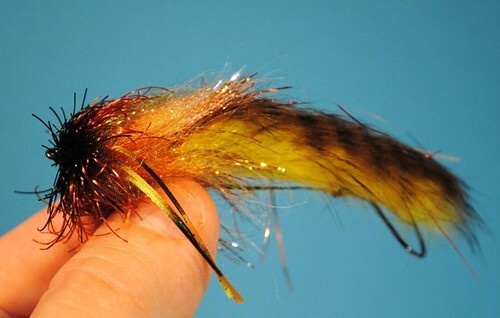 Small hot spotted soft hackle wet flies are another example of a simple pattern that laser dub works well with, and a style of fly patterns I enjoy fishing, and could not think of fishing without. I really don’t think many anglers have used laser dubbing for these types of tying or fly pattern applications. I have never been one not to try something once, and for us to be successful anglers on the Great Lakes where angling pressure is an issue at times, being different and fishing new patterns is just one of the ways to get a few good tugs. I’ve seen some of your new shaggy dubs. What are those about? And how are they being used? 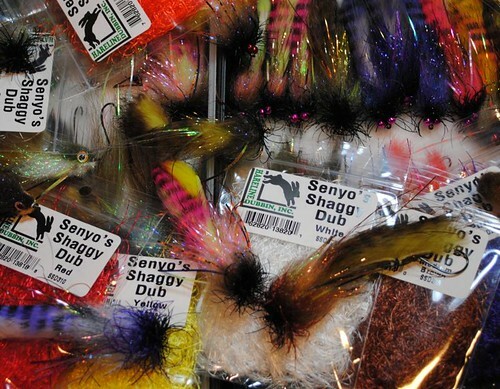 Senyo’s Shaggy Dub is a spandex micro hair material with similar properties to rubber. The major difference is Shaggy Dub is UV resistant and will not break down, crack, deteriorate, rot, and become unusable like rubber after being exposed to the elements and sun light. 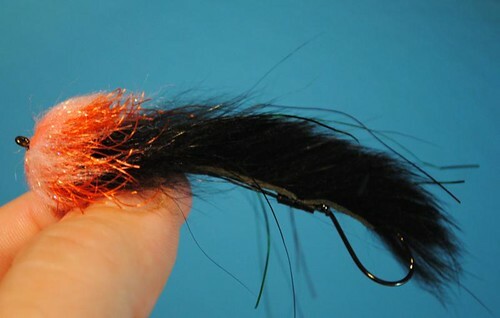 Shaggy Dub is also cut long so that it can be utilized by tiers for everything from small nymphs to extremely large streamers. The movement of this material brings your flies to life, and the faintest motion or water current creates an “Alive” pulse to the fly pattern. Shaggy dub is available in 12 colors and blends well with laser dub and Ice dubbing to create some wild bodies and heads on streamers and leeches to “turn it up a notch” on all you favorite steelhead/salmon bugs… Just cut off a chunk in your desired length blend or tie in straight! Customization is totally in the hands of the tier. Last year I started incorporating Shaggy dub into the sculpin heads and large streamers that I enjoy swinging for steelhead and salmon. Shaggy dub added a “Break Dance” type of movement and pulsed in the river current, some of my best days ever swinging flies came on patterns tied with this stuff. I also added Shaggy Dub to the rear and heads of intruder style patterns with great results. I have added Shaggy Dub to all my egg sucking leeches and I am still finding different ways to use this material, I think it gives the fish a fresh look, and I’m having a lot of fun doing it. Have you ever done any west coast steelheading? I have yet to experience the steelhead and salmon fishing of the West Coast, but It is only a matter of time! The Great Lakes Region has always had so many rivers that offer stellar fishing opportunities for the fly angler! Michigan’s Muskegon and Manistee Rivers, Ohio’s Grand River and Conneaut Creek, Pennsylvania’s Elk Creek, The Catt and Salmon River in New York State, and the Garden River in Ontario. So many places to choose from for year round fishing opportunities, just as I am sure many of you enjoy the same experiences and choices in the west. Most of my open travel time has been spent going to Alaska and has become a yearly event for our guide staff. I do tie a lot of custom fly orders each season for West Coast Anglers, and have several great West Coast friends to share stories with. I have a true appreciation and love for fishing flies on the swing. West Coast steelhead tactics have really helped open a whole new way of tying, fishing, thinking, and is a positive influence in the way many are sharing their fishing time on our Great Lakes streams. Even though we are located in opposite parts of the country on entirely different fisheries, were all have much more in common that you can possibly imagine, and we all share the same concerns and passions about fish on the fly and the water they live in. I want to know how I can purchase the latest dubbing products you are marketing. I have use some of your stuff & I like the results of my flies that utilized your dubbing. Last year I saw a fly that was made of the Senyo’s Laser Dub only. It was an egg pattern that I thought was called a Laser egg or Senyos laser egg but I have been looking for the pattern periodically for the past year and have not come across it again. Do you know the pattern I have in mind and if so do you have a link or a picture of it? Thanks! Glad to see that you’ve continued the manufacture of laser mtl. Ed Bordas was a good friend of mine (I turned him on to the Renzetti Presentation Vise and Loomis rods back in 1987 or so) and he insisted on showing me his machine after he was granted a patent for his product. I bought about $200.00 worth from his wife, Ann, following Ed’s death. Since I just got back into steelhead fishing last season (after a long hiatus) I was somewhat excited to see the (similar) product back in the tackle shops. Enjoy using laser dub with clear finger nail polish on my streamer heads. I’ve named them crunch minnows.